As the Tone 8 of Justice, we are positioned for the Justice that would be offered for a Divine Intention of to Receive the Light of Reed/BEN, the Light that Shines all around through One Divine Inter-connected Family born of Light and Earth. Humanity was Created from Father Sky and Mother Earth. Our Spirit’s Identity would always reflect the Thread of Either in our Line that connects us ALL as One. AHAU intended for us to See it. Sun/AHAU is a day for a Personal Revelation of Light. In all our direct encounters with the Sun, a Light Shines on our True Identity – Children of the Light. We can think of what our Ancestors mean to us, and a loss we feel when they’ve gone and we are the ones left to carry on. Their gifts were an important part of living we seldom realize in full, until they are gone. They were created to be important to Human. Everything we are was meant to be. Sun/AHAU resides in the South, the direction of our Relationships with each other and with the Natural World. AHAU influences us through Relationships on Earth, that Transcend to Relationships in Spirit. The 13 Tones are steps to a Divine Relationship, marked from the Hours of Human’s Day. They represent 12 hours of Solar Light from 5AM to 5PM in the Maya’s land. They mark the hours that Human spends in the sunlight – the Hours We Create. In the 13th Hour we return to the Dream, and see the New World in a Divine and Mystic Reunion. Tone 8 is the Zenith Hour of Solar Light, the Full Light of Mid-Day. 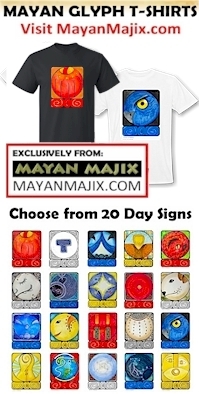 This is the Holy Hour and Day the Maya recognized for the observance of Holy festivals, Sacred Ceremonies, and celebrations. In this Pinnacle of Light, Human exists in Spirit. From the Top of the Pyramid, instead of choosing steps that led down, we looked Above at the Reflection. The Maya believed that in the Reflection at Tone 7, we see the stairs below continuing into a Realm Above. The top of the pyramid was an Altar given for a Leap of Faith. Tone 8 holds the Intention of Divine Justice. Tone 8 reveals the Solar Light to see the Truth that will Transform us to a Higher Ground of Divine Consciousness. Sun/AHAU makes everything Move toward a Higher Light. The Zenithal Sun was a Sign to Move into Creation. In the tropical region of the Maya, there are only two seasons, the Rainy Season and the Dry Season. They didn’t look to the Spring or Fall equinox as Signs for the Planting and Harvest of the Corn. They looked to the Zenith of Solar Light that existed between each season. It marked the path in the middle of two seasons – the warm and moist Season between the Rainy and the Dry. When this magical column of Light Appeared it was the Sign to Move, to gather up the Seed of the last generation and run to the fields for planting of the Corn. The Zenithal Sun is a direction by a Supreme Creator to Move Forward in The Creation. Our Reed/BEN Channels of Light are open for the Highest Transmission. Through this One Channel of Light, all the Love of the Creator, and the Love of all Humanity, reaches down as the One Hand of Light. Together they are the Hand that Reaches to us from our Divine Destiny, a Helping Hand that can pull us through the Veil of Spirit to the stairs that continue Above. Sun/AHAU offers the Inner Strength of Intention, Courage, and Willingness to Make the Leap. Sun/AHAU is the Master of ALL THINGS, the Source of all our Divine Genius. The Sun collected all the Lights Above as the Wisdom of all there ever has been, and ever could be experienced as an Expression of God’s Love of Humanity. Each one of us holds a Spark of Light revealing the Love for Who We Are. Just as we Are, we ALL hold the Divine Consciousness to be Genius at Something We Love. The One that is us, is the story of how it happened. The Light that is Our Whole is Intended to reflect a Divine Image of the Dawn of our Awakening, a story that Begins and Ends with Love. As a dynamic experience of Beauty, it wasn’t drawn as a straight line from one place to another. It was dynamically illustrated as a double-helix Spiral of circles, that like the Smoke of our Prayers on the Breath of Spirit, Rises to the Great Spirit Above. Our Circle is Infinite in the Below, never ending. In the Reflection Above, we can see the circles were a 2 dimensional reflection of Spirals, a Channel through which we could pass from One Realm to Another. In the Up, Down, and All Around, there would never be a ceiling – but Spiritual Heights that would continue to rise Forever. This Reed/BEN Communion of Divine Spirits has introduced some Old Spirits into my experience. There have been Signs of a Divine Communion all around, Signs of Revelation, and Signs of People that have gone before. It feels like “going out on a limb” to share the thoughts with you. I thought my thoughts from the beginning of my journal would be seen by many as “out in left field.” I was too timid to sign my name… in case someone who “knew” me, might see how “out there” I really was. We’re ALL being pushed to Higher and Higher things. Only today did I notice how the days of the month of February were following the same course as the Tzolk’in Tones of the Reed/BEN trecena. Then I remembered that February 1 marked the observances for St. Brigid and the making of St. Brigid’s Cross. I remembered her on February 1, though in the moment I didn’t have the clear discernment of how it fit this trecena of Reed/BEN. Today it appeared in Full Light. By Culnacreann – Own work, CC BY 3.0, St. Brigid’s Cross (Photo Source) Here’s a link to instructions for making one. Saint Brigid of Kildare was a symbol of the Divine Mother, related to the Divine Feminine of Compassionate Love, the Womb of Family. The St. Brigid Cross is made of Reeds woven together. Road/EB, the Sign of Human and the calendar, is known as “Grass” by the Aztecs. Grass reflected Human’s perennial nature, dormant through Winter, and coming back to Life Each Spring. St. Brigid is a Sign of Spring. In perfect synchronicity with Reed/BEN, we are being drawn back to New Life, and the Light of our Spirits is being woven together. It’s curious how the center of the cross weaves together as a reflection of a pyramid. That was not all that St. Brigid had to share. St. Brigid’s Day marked half way between the Fall and Spring equinox, the Zenith’s position of Light. And today on Sun/AHAU, I discover this Cross is said to have it’s origin in the SUN CROSS. The illustration is part of the Celtic Cross, highlighting it’s Center. And, obviously, the same circle we see in the Medicine Wheel pointing to each of the 4 directions. Human was given Signs and Symbols to mark a synchronicity of experience… just like the Zenithal Sun was the Sign to get busy and plant the Seed of a New Creation. We can see these Symbols for the Truth they represent. There IS a Divine Connection that connects the Above to the Below. There IS a Divine Time for every Spiritual Experience in a Place where the Light will best be seen. 8 Sun/AHAU is a Time and Place for an Illumination. In these symbols, an “X Marks the Spot” in the Center. My own “out on a limb” experience has been a connection to Ian Xel Lungold. This trecena, I’ve heard his Voice – one I never heard face to face – but clearly recognized in Spirit. He came through Loud and Clear on the days surrounding Wisdom/CIB, that connects us to the Old Ones. We had just observed Ground Hog Day, the Foretelling of a Future Light. Ground Hog’s Day marked Candlemas Day, the first day that Jesus was taken by Joseph and Mary to the temple. Candlemas was a foretelling of Light. I remembered how Ian had led us all to a High Altar in the Yucatan, guarded by Black Jaguar for the Illumination of Darkness. We were ALL meant to Receive a Blessing of Forgiveness from the Sacred Ceremony. It all came together as a Symbol and Sign of Light. Ian’s Gift to us as the Exchange for our Offering was to foretell a future Light. We slept in the Dream all Winter. Now the Meaning and Purpose of the Time and Place is revealed in the new Spring in the Zenith Hour of Solar Light – our Greatest Abundance of Light all drawn into One Light. Ian’s last Creation we went to claim on his behalf was the Dream to join a Legion of Angels on the “otherside” for the Intention of Offering a Provision of Light to us. Ian’s message to the Whole is to watch for the Light, because a New Light of Spirit is on the way. Numbers of synchronicity surrounded the whole experience of Ek’ Balam, marking experiences with Signs that drew our attention to the message of it all. Ian’s message revealed the Magic in the Numbers, and the Light they could shine for the Whole. I’ve been so invested in learning all the Day Signs. Ian is illuminating the Magic and Light still waiting to be revealed to us through numbers. I call on you to go out on a limb in a Leap of Faith. Watch and Vigilantly Observe all things around you. Look for the Signs in the Sky, Signs in the 4 directions, and Signs in the Numbers. Someone is trying to connect to you from the Above to the Below. You’ll know it when you See or Hear it. You only need to accept that it’s possible to Believe it… how you would Love to Believe it. We can Choose to Believe through a Leap of Faith, and the Creator will transform our Faith into Believing. It’s all a Free Choice of Being Human. We’re standing at some kind of threshold. with the courage to leap, we might find out we can fly. We could fly to plant the Dream between Earth and Sky. Today is the planting day marked for the Greatest Abundance – the Zenith Time and Place. To all my relations, may we see the Truth of Two Zenith Lights that shine down for Human as a Blessing to Spirit, the Light of the Creator, and the Light of the Whole. May we Kneel to the Spirits of Divinity in each of us. May we meet in the Center to be changed by Light in every direction – the East, North, West and South, the Up Above, Down Below. Our Divine Justice will prove the Cause and Effect when see one another for all the Light we Are. May we take a small step for Human, and a Leap of Faith for Mankind. May we Receive the Will and Perseverance of Sun/AHAU to SEE OUR SELF in a way, we never dared before. May we be woven together like the perennial Grass that falls asleep in the Winter and Awakens to Spring our roots connected below. May we Believe in Ian’s Creation of a Channel of Love and Light that was offered to ALL of us, Personally, One-on-One. May we Know that if we Believe in Spirit at all, it would only make sense that Ian would shine a Light to those following footprints he left behind. Ian dreamed of another chance to be with us. Under the Number 8 of the Creator’s Justice, may we Dare to step forward to Ask for the Justice we REALLY Deserve. Ian’s Light of 12 Sun/AHAU was intended to offer an Illumination of Understanding (marked by a Day Sign of Divine Illumination in the Direction of Relationship). May we hold Faith we are connected to Ones we Loved, and who Loved us before, for the chance to Greet a Divine Visitation from the One Light that shines for us ALL. I’m grateful for the Infinity of the Creator’s Love that was placed at The Creation in the East, North, West, and South, in the Up Above and the Down Below that manifested the All Around experience of Loving Each Other, right at the Center of our own Times and Places of Experience of the Beauty of Mother Earth. How Beautiful would All Human Love be, seen together? Wow, this is a lot to process!!! Thank you for sharing this knowledge. As I seek my own personal renewal and regeneration as artist/human, your informative words are both guidance and reaffirmation that I [the micro] can reconnect to the universe and universal unconditional love [the macro] through my belief and acceptance of my own spirit and its power and connection to the creator and the divine. I continue to seek to renew my spirit, reassess and renew my life’s journey to be sure that I am keeping my covenants with the creator and the ancestors who are my sponsors. Thank you for sharing and keeping us informed.